Most buildings have a “wet riser” system where the pipes are kept full of water for manual or automatic fire fighting operations. Dry risers are used when the water pressure of a building wouldn’t be enough for fire suppression, and in unheated buildings where the pipes could freeze. Dry risers have to allow access to a fire engine within 18 m of the dry riser inlet box. 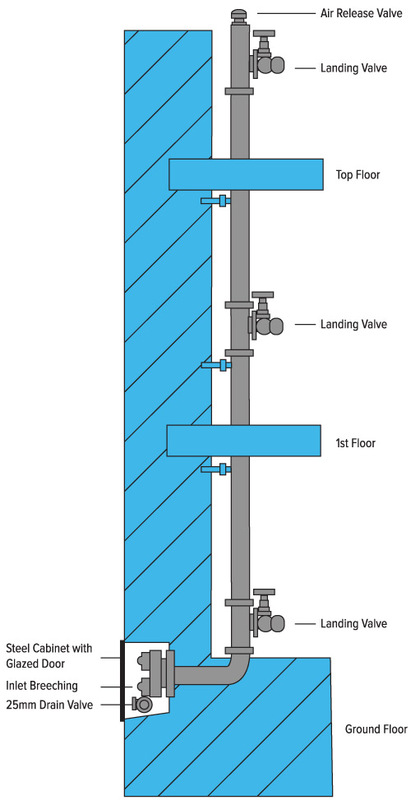 Dry risers in occupied buildings have to be within a fire-resistant shaft, usually one of a building’s fire escape staircase enclosures. Dry risers include an inlet which is an external access point at ground level through which water can be pumped from the fire department’s fire engine pump to firefighters’ fire hose attachments on each floor. Wet & Dry risers must be serviced and maintained annually. They’re flow rate is tested, pressure tested at the highest valve point. Their valves are checked for damaged seals and various other important checks are carried out including the air release valve at the top of the riser. Laying a firehose up a stairwell takes time, and this time is saved by having fixed hose outlets already in place. There is also a tendency for heavy wet hoses to slide downward when placed on an incline (such as the incline seen in a stairwell), whereas dry risers do not move. The use of dry risers keeps stairwells clear and is safer for exiting occupants. Dry risers go in a direct up and down direction rather than looping around the stairwell, greatly reducing the length and thus the loss of water pressure due to friction loss. Additionally, standpipes are rigid and do not kink, which can occur when a firehose is improperly laid on a stairwell. If you would like to have a quote for either a Wet Riser or a Dry Riser please contact us via the contact page here, or you could call us or email us with the details on the contact page.